Thank you for using the VR-100 Virtual Reality (VR) Headset. We hope you enjoy them! 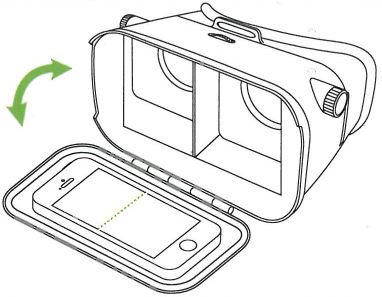 VR headsets uses a smartphone in split screen mode to produce an image for the left and right eye creating a virtual 3D experience. Use this device with your mobile device and enjoy multimedia content and Apps. Straps on the headset can be adjusted with Velcro ends for a secure but comfortable fit. 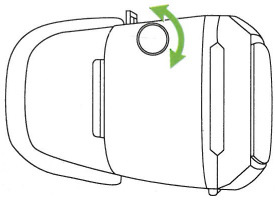 Smartphone is inserted into a centered position in the spring adjustment bracket, with screen facing the inside of the headset. Wheels on sides of the headset are for focal adjustment, adjusts the distance between the smartphone device and the headset lenses. No volume- check the mobile device volume setting. Can’t see screen- make sure the screen is facing the lenses, make sure screen is active. Uncomfortable while using- Check strap adjustments, make sure device is centered in bracket.